We tend to take food packaging for granted - except for the times we complain that supermarkets have "too much packaging". This is rather an insult to a lot of good scientists. Price pressures are always forcing supermarkets to reduce the amount of packaging (not for "luxury" goods where users often pay simply for a nice package) while at the same time reducing the wastage of the food being transpored/stored and extending the shelf-life of the product. Modern packaging is scientifically awesome. 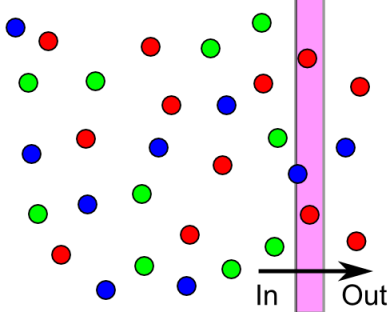 Loss of flavor, or, more particularly, loss of specific aspects of a flavor (in the image the red molecules are being lost faster than the blue, with no green loss) is known as "flavor scalping" and is a serious problem for the food packaging industry. That apparently simple bit of plastic film you throw into the garbage is actually a sophisticated 5-layer co-extruded film that keeps bad stuff out (e.g. oxygen) while keeping good stuff in (e.g. flavor). The wrong package design can be scientifically and commercially disastrous. One company developed an exciting new fruit-juice concept. The all-natural juice flavor was tailored to be nicely water soluble so a small amount of juice packed a large flavor punch. The flavor was a relatively simple one and contained "only" ~20 flavor molecules. The package was a simple polyolefin molded shape with a relatively thick wall. Many aspects of the package were technically very smart and do not concern us here. Things started to go wrong during standard shelf-life tests. The fruit flavor which could be stored in bulk for many months lost much of its "zing" after just a few weeks in the package. Because flavours are made from many components, the team measured "before" and "after" to see which flavor molecules were being lost. No-one could offer an explanation for why some molecules were disappearing (nor could anyone say where they were going) while others were staying. Someone suggested an analysis via HSP and here is what was found. 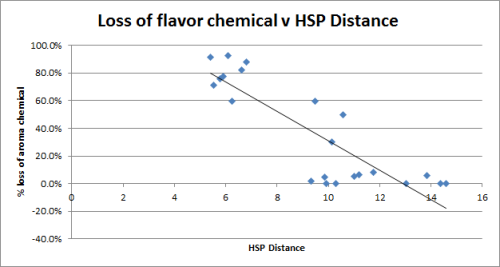 The Y-axis shows the % loss of each component of the flavor and the X-axis shows the estimated HSP Distance between the flavor molecule and the polyolefin. It's not a perfect correlation but there is a lot of uncertainty in the % loss measurements for minor components and the HSP of some of the molecules are estimated values. 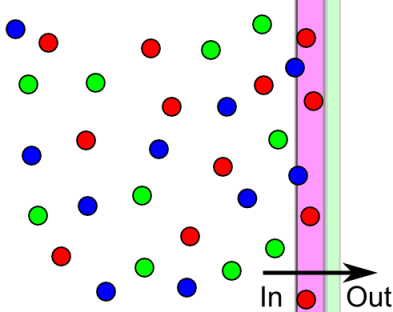 Returning to the opening figure, the red molecules have a short distance and are easily lost, the blue molecules have an intermediate distance and are lost less easily and the green molecules have a large distance and are not lost. But it suggested a clear hypothesis: those molecules that were closer in HSP terms to the polyolefin were diffusing into the polymer and therefore lost to the flavor. Because the team had sniffed the packaging polymer and could detect no significant odour, they had assumed that the molecules had been lost elsewhere. But the hypothesis suggested that the molecules were relatively deep inside the thick polymer package and would only be detected by head-space GC. Indeed, when that simple test was carried out, all those lost molecules were found to be in the polymer. It must be stressed that the team working on this project was an excellent, disciplined, hard-working cross-functional team. The root cause was a lack of knowledge not just in their company but across the industry of this simple correlation between HSP Distance and potential flavor loss. With this simple calculator, featuring an eclectic range of flavor molecules covering the main classes of hydrocarbons, aldehydes, ketones, alcohols and acids (plus oxygen and radon, see below), it is easy to confirm that it's not a good idea to have limonene in a PE container or (see below) cinnamon buns in PLA. Of course there is more to flavor scalping than HSP Distance, because so much depends on the diffusion coefficient of each molecule which, in turn, depends on the specific polymer, temperature and molecular shape/size. The diffusion coefficient calculator in the Diffusion Science section of this website comes from the food industry where such calculations are vital for flavor and safety reasons. One reason for the popularity of PET is that diffusion coefficients are inherently low within this tightly packed highly oriented polymer. But even though diffusion coefficients play a big part, the simple HSP Distance calculation is a powerful tool for alerting a team to potential problems. Doing it at the start of the above project would have saved a lot of time and money. For example, it might have suggested that PET with its low diffusion coefficient and its relatively large HSP distance from the lost components would have been better. Or, see below, they might have chosen a multilayer packaging approach. In Abbott's chapter in a book on polylactic acid (see PLA) he was able to show (easily confirmed with the calculator above) that one of the standard flavor test molecules, limonene, is far from PLA and is therefore not likely to be scalped. Indeed, there are good experimental data to show this. The chapter (and the calculator) also predicts that PLA would be useless for packaging cinnamon buns as the key flavor component, cinnamaldehyde, is a short distance from PLA and will be easily scalped. Why are "simple" packaging films often 5-layer? Why go to all that trouble for a bit of plastic that's just thrown in the garbage? The answer is straightforward. Suppose the above flavor were packaged in a thin layer of polyethylene. As a polyolefin, the HSP distance to many of the aroma molecules would be low so there would be a lot of loss. OK, so package it in EVOH. With the high δH of the EVOH you can be sure that the distance of the PE-friendly molecules would be large, so they would not migrate. However, there are many fruit flavors with relatively hydrophilic (high δH) molecules so these would easily be lost - not to mention the fact that water would destroy the EVOH very quickly. So the obvious trick is to make a PE:EVOH:PE film (with extra layers to help the PE to stick to the EVOH). Yes, the PE-friendly molecules (red) would quickly penetrate the PE, but would get stuck at the EVOH. And the EVOH-friendly molecules (green) (and the water) never get a chance to see the EVOH as they can't get past the PE. The above paragraph can, of course, be translated into proper scientific terms and implemented as a mult-layer diffusion calculation. The results completely support the idea that a multi-layer barrier can provide astonishing barrier qualities for a very small amount of polymer. It gets even better. The HSP Distance between oxygen and PE is relatively low, and PE is a poor oxygen barrier. But oxygen is very far from EVOH which, therefore, is a very good oxygen barrier. So a typical PE:EVOH:PE food film provides excellent flavor barrier properties while also providing a reasonable oxygen barrier. Those of you who live in parts of the world with lots of granite beneath you know that radon gas can get into your home and pose a radiation hazard. The simplest effective barrier against radon is EVOH, but you can't have that in wet soil around your house. But co-extrude the EVOH within PE and you have a low-cost, robust radon barrier. We can extend the logic even further. It is often desirable to build houses on brown-field sites which might have residual industrial pollution. It is necessary to provide a barrier membrane beneath the houses to stop pollutants such as benzene from migrating into the building. Historically, people have used a thick HDPE sheet, claiming that it is "hydrocarbon resistant". This is outrageous. Simple science and practical experiments show that benzene zips through 2mm of HDPE in just a few days, providing a very poor barrier over the long term. Yet take a barrier film just 1/4 the thickness with a PE:EVOH:PE construction and benzene permeation drops by many orders of magnitude. One company, ITP even has a permeation calculator written by Hansen and Abbott using HSP and diffusion theory to predict the long-term fluxes of chemicals through various membranes such as HDPE and their own multi-layer laminate. It is interesting that the apparently sophisticated world of environmental protection is only just starting to learn the lessons of multi-layer packaging that the apparently simple (though in reality anything but!) world of food packaging worked out decades ago. A government funded project that I helped to oversee had the intent of developing improved chemical protective gloves especially for epoxy work. The inventor actually went to a local company that sold packaging for coffee. This turned out to be a 5-layer EVOH laminate just as described above. This was a wonderful barrier for not only epoxy, but many other things, just as the science suggested. There were some smaller amines that might get through, and some more things at higher temperature, but that is minor. The problem was that it was too stiff. One used cotton gloves inside at times, and developed a variant with sleeves up to the shoulders. What is interesting is that at the time (~1988) the food industry did not understand the science of these barriers. But the glove inventor, Henning Henriksen, did and included the science in his patent on the system.